Mechanical seal rings are used to seal the clearance between the rotating shaft and the stationary housing in equipment such as pumps and mixers so that liquid cannot leak out through this clearance. These sealing mechanisms are often referred to as shaft seals or pump seals. Metcar manufactures the primary rings or carbon/graphite wear faces used in many of today’s most sophisticated and reliable mechanical seals for industrial, aerospace, and military applications. 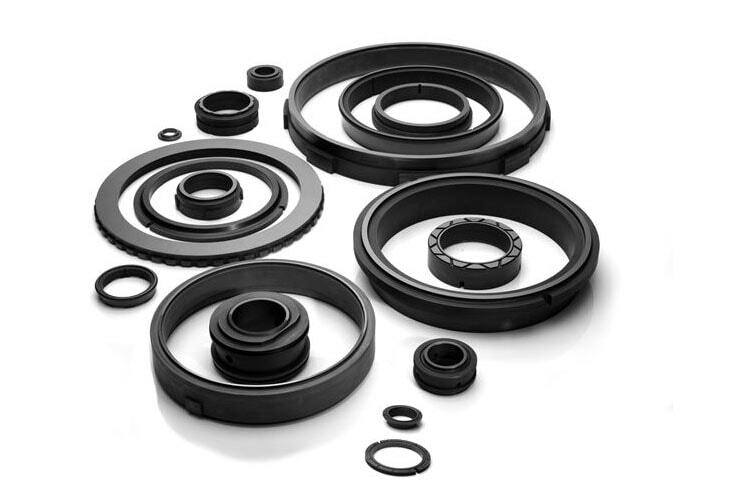 These mechanical seal assemblies usually consist of a carbon/graphite primary seal ring, a counter face ring, secondary (O-ring) seal rings, springs, fasteners, and a metal housing. Mechanical seal assemblies are also used to seal gases in high-speed compressors. These dry gas seals are double mechanical seals that utilize a controlled barrier gas and spiral grooves in the counter face which provide aerodynamic liftoff or gas lubrication between the seal faces. Mechanical seal primary rings can be supplied to customer drawings and specifications. The rings can be supplied plain, shrink-fitted, or cemented in metal retaining rings. Metcar mechanical seal rings can also be supplied with the sealing face lapped flat to one helium-light band. size limit:Mechanical seal rings are available up to 24’ OD.